Putera Sampoerna attained his fortune as heir to the Sampoerna cigarette company (PT HM Sampoerna Tbk. ), one of Indonesia’s largest tobacco company. Being born rich, Putera was educated abroad since young, completing his secondary education in Hong Kong and college education in USA. 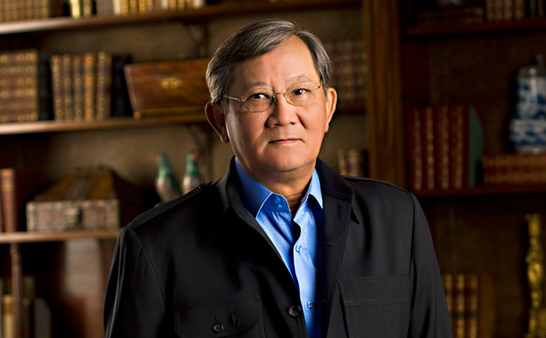 He led the company from 1978 until 2000, when he was replaced by his son Michael Sampoerna. In 2005, Putera sold the company to Philip Morris for $5.4 billion in 2005. After the sale of PT HM Sampoerna, Putera and his family founded the Sampoerna Strategic Group, which represents the transformation of Sampoerna’s business, after withdrawing from the cigarette business. Sampoerna Strategic Group has businesses in the agriculture, finance, property, telecommunications and timber industries. Steeped in the Sampoerna’s value and philosophy, Sampoerna Strategic Group embraces Anggarda Paramita (Towards Excellence) as a way of life. This is an endless search for perfection that is integrally tied to all aspects of the business. The Group embraces “The Three Hands” philosophy, which symbolises the harmonious relationship between the Company, business partners and community. In 2001, Putera founded the Putera Sampoerna Foundation, a non-profit organization dedicated to improving the quality of and access to education in Indonesia. One of the main aims of the foundation is to shift from a ‘profit-seeking’ business mindset to a ‘concern to help the greater community’. Putera introduced the concept of social business in Indonesia at a time when it is not commonly known. People are familiar with the concept of philanthropy and charitable organizations that help the greater community through philanthropic programs. In order to ensure the sustainability of these programs, Putera believes that the focus needs to be on helping the greater community, following which energy will be concentrated on reaching that goal by developing sustainable programs that the communities can eventually manage by themselves in the long run.